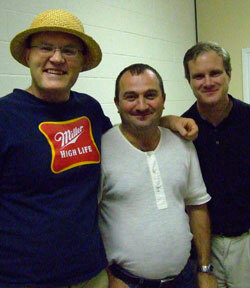 Jesse Kraai, Melikset Khachian and John Donaldson. Photo Michael Stephen Sekuloff. All Rights Reserved. The 2nd Edmonton International, a Category 4 (2346 FIDE average) IM norm round robin held August 2-6 at the Edmonton Chess Club, was won by GM Melik Khachian in convincing fashion with 7.5 from 9. The 37-year-old Khachian, who played for the Armenian national team before settling in Los Angeles in 2001 considered it one of the best results of his career. He showed great versatility throughout the event winning nice attacks and also grinding opponents in the endgame. Here Melikset annotates his favorite game from the event, against IM Axel Bachmann. 4...d5 5.exd5 Nd4 6.Bg2 Bg4 was another approach. I spent about 10 minutes here trying to remember the variation, but I guess I was just little bit tired and in the end decided just to play more solidly. This was an important moment. White needed to play 9.Kh1 to avoid any possible discovery check from the Black knight on f6. I was surprised that my opponent played his King to h2 so fast. 10.exd5 Nxd5 11.Nxd5 Bxd5 12.Nc3 Bxg2 13.Kxg2 with equality is White what should have done. He obviously didn't see Black's response. To control the h6-c1 diagonal and also eye the h3 pawn. 13.Nd2?! 13. Qd2 still offered White good chances to equalize the game since the position is locked and hard to break open. 13...Bd6 14.a3 b5 15.Ng1 Ne7 16.Bf3 Trying to trade white color bishops,but the position still remain very unpleasant for White. The Bishop must be on the diagonal f8-a3 in order to attack the a3 and b4 pawns. White is in big trouble. Desperation time. This tactical blow is going to finish White off. Melikset celebrates his victory. Photo Michael Stephen Sekuloff. All Rights Reserved. Jessie Kraai of Santa Fe, New Mexico , who will receive his GM title this September (Read the Chess Life Magazine interview with him), started slowly with only one point from his first three games but finished very strongly. Jesse first came to the attention of the American chess public when he won the Arnold Denker Tournament of High School Champions in 1989 but his development as a chess player was delayed as he took time off to earn a doctorate in philosophy from the University of Heidelberg. Jesse Kraai in Edmonton. Photo Michael Stephen Sekuloff. All Rights Reserved. The 34-year-old Kraai dedicated the last four years of his life to achieving the GM but parts of his training program might surprise many. He only owns about a dozen chess books and feels that few of the 100,000 plus tomes written on the game have real value. One that Jesse highly recommends is Vasily Smyslov -Endgame Virtuoso which he feels helped take him over the hump from IM to GM. He also studies his own games very carefully. In an interview with Julie Ann Grimm for the New Mexican Jesse said, "I just study my own games, but I review them and really self-psychoanalyze," he said. "I am making the same kinds of mistakes over and over again, and everyone does, but you have to really be able to look at yourself honestly to find those things and try to stop doing them." Here is Jesse's game against Axel Bachmann. Black can try to combat the pillars of the Maroczy Bind with ...b5 or ...f5 or as in the game play on the dark squares with ...Bd7, ...a5, ...Nd7 followed by trading Bishops with ...Nd7-c5 and possibly ...e5 and ..Ne6-d4. The dark side of grabbing space with e4 and c4 is White's light squared Bishop is a potential liability. Note this anti-Maroczy treatment was a great favorite of Bent Larsen. 10.Rc1 Nxd4 11.Bxd4 Bc6 12.f3 a5 13.b3 Nd7 14.Be3 is a more positional approach. Jesse is planning something much more aggressive - a rook lift to h3 for a kingside attack. ; Note 10.Qd2 will usually transpose to the text. 12...Nd7 13.Bxg7 Kxg7 14.Qd2 a6 15.b4 b6 16.Re3 Nf6 17.Rae1 a5 18.b5 Bb7 19.Rh3 h5 20.f4 e5 21.f5 Rh8 22.Rf3 gave White a strong attack in Kraai-Zavadsky, Berkeley 2005. Black's play in this line is on the dark squares (White has put his pawns on e4 and c4) so the offer to trade Bishops is thematic, but it does weaken his King. This is the key position for this variation and one that is no stranger to Jesse who has reached it at least twice before. 15...e5 16.Rh3 h5 17.Rd1 Nc5 18.Bb1 a4 19.Re3 Ne6 20.Qxd6 Qxd6 21.Rxd6 and Black did not have enough for the pawn in Kraai-Battsetseg, US (ch) San Diego 2004 and ; 15...h6 the most commonly seen move allowing Rh3 to be countered ...Rh8. 16.Rae1 a4 17.f4 Qb6 18.Bf1 e5 19.f5 Nf6 20.Kh1 Rad8 21.Bd3 Rh8 22.fxg6 fxg6 23.Rf1 Rhf8 24.Ref3 Nh7 25.Qf2 Qxf2 26.R3xf2 Rxf2 27.Rxf2 Ng5= Kraai-Van de Mortel, Chicago 2005.; 15...Qb6 16.Rh3 h5? 17.Rxh5! was the famous game Grischuk-Serper, New Delhi 2000, which continued 17...gxh5 18.Qg5+ Kh8 19.Qxh5+ Kg7 20.Qg5+ Kh8 21.Re1! with a winning attack. This is too risky and loosening. Better is 17...Qb6 hitting b2, threatening a discovered check and grabbing some dark squares. 18.Kh1 Nxd3 19.Rxd3 Qb4 20.b3 a4 was better with only a small advantage for White. White eyes the weaknesses on e6 and e7. 19.Nxe4 Bxe4 20.Bxe4 Nxe4 transposes while 20...e5 runs into 21.Bxg6! The trade of all the minor pieces has enhanced rather than diminished White's advantage. The weaknesses on b7, e7 and g6 are hard to defend. Trying for counterplay is Black's best try here. 21...Rc8 22.Rb3 Rc7 (22...b6 23.Qe3 hits both b6 and e7) 23.Qxa5 Rxc4 24.Qxd8 Rc1+ 25.Kf2 Rxd8 26.Rxe7+ Kf6 27.Rbxb7 is an easy win for White. Jesse plays the next part of the game very well, avoiding winning material if it costs any of his positional advantage. He will choose the moment to cash in his chips. 23.fxe5?! dxe5 24.Qe2 Qg5 25.Rxe5? Qc1+ is just the sort of thing Black is hoping for. 23...Qe7 24.fxe5 dxe5 25.Rxe5 wins the pawn cleanly. Now Axel put his hopes in activating his Rook via ...Rb8 and ...Rxb2 but Jesse gives no chances. 27.Re7 Qh8 28.Qe4 Qf6 29.Re6 Qf7 30.Rxd6 Re8 31.Qd4 was also possible but I like the well calculated line that White chose. My preparation in the weeks before the tournament consisted of teaching at the Mechanics' Institute's yearly chess camp, directing the 2nd Konig Memorial, fundraising for the Institute and finishing some writing projects so I was not optimistic about my prospects, especially as I had played little serious chess the past few years. Despite all this, things worked out and I was pleased with my final placing. It helped that conditions for the event were excellent and all the players were very friendly. Here is my most interesting game, against Zhichao Li. There is nothing wrong with the text but White has no clear way to recover the pawn after 4...dxc4!? though he has many ways (5.0–0, 5.Qc2, 5.Na3) to obtain compensation. This move and not 9.d4 is necessary. To activate the Bishop on g2 White needs to be able to play e2-e4. 9...Be7 10.Bf4 0–0 11.Rac1 Qd7?! It's understandable that Black wants to get his Queen off the c-file and complete development by connecting his Rooks, but the often played text runs into a strong shot. Instead 11...Bg6 12.Ne5 Nd7 , as played by Karpov in his 1974 Candidates Final with Kortchnoi, was safer. I believe the text was first played by GM Barcza against Smyslov at the 1956 Olympiad in Moscow where the highly motivated Hungarians defeated their Soviet counterparts. Declining the offer doesn't help Black: 13...Bg4 14.Ne5 Nxe5 15.Bxe5 Rfd8 16.h3 Bh5 17.g4 Bg6 18.Rfd1 and White has a big positional advantage. ; 13...Bxe4 14.Nxe4 Nxe4 15.Ne5 Nxe5 16.Bxe4 will transpose. 15...Qd5?? 16.Bxe4 Qxe4 17.Qxb7 wins immediately. The point of White's play beginning with 12.e4! He recovers his pawn while keeping Black in a bind. Zhichao Li shows excellent instincts despite being on unfamiliar ground. The danger for Black in this position is that White will build up slowly with a4 and b4-b5 and tie Black down to the defense of a7. Should this occur there is a very real possibility Black may face two advanced connected passed pawns at some point. With the text Black envisions trading his a-pawn for one of White's two queenside pawns. 21...h6 22.Be5 Bg5 23.Rc4 Qd1+ 24.Kg2 Rd8 25.Qf3 Qxf3+ 26.Kxf3 Bf6 27.Bxf6 gxf6 28.Ke3 and Black soon lost in Barcza-Smyslov, Moscow (ol) 1956. ; 21...Bf6 22.b4 Bd4 23.Bd6 h5 24.a4 g6 25.Rc4 e5 26.b5 and White had a clear advantage and went on to win in Donaldson-Rey, Berkeley 1999. To stop Black from playing ...a4 at some point. 22...Bb4 , as played in Barcza-Malich, Kecskemet 1968, is probably best. The text, which is connected with a plan to activate Black's Queen and Rook, is too active. On 25...Rf8 or; 25...Rb8 White has 26.Be3 followed by Rd4 taking control of all the central files. IM John Donaldson Photo Michael Stephen Sekuloff. All Rights Reserved. The players occupying the next two spots, the youngest in the event, definitely expected to do better. 20-year-old Valery Aveskulov of the Ukraine, who spent the first half of 2007 living in Omaha, simply played too much chess this summer. Right before Edmonton he had played 20 games in three weeks in the Canadian and Quebec Opens and it was clear early on that Valery was not in his best form losing to FM Greg Huber early on and surviving some difficult moments in other games. Still, after seven rounds he had five points and every expectation of a top placing but them Caissa deserted him in his game with me and Li Zhichao held him to a draw in the last round. Valery is returning to the Ukraine this month but should be back studying at the University of Maryland at Baltimore County in 2008. He will be a great addition for US chess. A glimpse of Valery Aveskulov's game face. Photo Michael Stephen Sekuloff. All Rights Reserved. Axel Bachmann is another player who is going to make the chess scene in the US richer. The 17-year-old IM from Paraguay, who will start his studies at the University of Texas at Brownsville this fall, is a talented tactician whose chess skills will definitely improve under the tutelage of new UTB chess coach GM Gilberto Hernandez. Expect Axel to earn his GM title very soon. The four Alberta players competing in the event, two each from Calgary and Edmonton, can be described in one word - underrated! Much like players from the interior of the US that lack the plentiful rating point pools to be found on the coasts, the four Albertans were much stronger than their ratings. The IM norm for the event of 6 points was too much for them but they fought hard. Alberta champ Jeff Reeve was plagued for much of the event by declining a draw offer in round one from GM Aveskulov. Reeve, who was a pawn up in an ending, figured he couldn't lose but ... Anyone who has played in a roundrobin, where you are just as likely to face a stronger player rather than a weaker one after a loss, knows that such moments are not easy to forget. Both FM Greg Huber and Zhichao Li collected scalps and rating points. Li, at 2143 FIDE, is my candidate for the most underrated player in North America. Dale Haessel has an excellent knowledge of theory and only needs to be more practical in his clock management to make a big jump in his rating. Vlad Rekhson, assisted by Micah Hughey, organized and directed the 2nd Edmonton International and they did an excellent job. Americans looking at the series of excellent tournaments held in Canada this summer including the Canadian and Quebec Opens, Montreal Empressa, and Monroi Womens Grand Prix and Edmonton might wonder what is going. How is that a country with approximately a tenth of the US population (30 million plus) and likely an even smaller chess population, is able to put on so many quality events? Credit dedicated local organizers and enlightened government programs that provide funding. Photo Michael Stephen Sekuloff. All Rights Reserved.